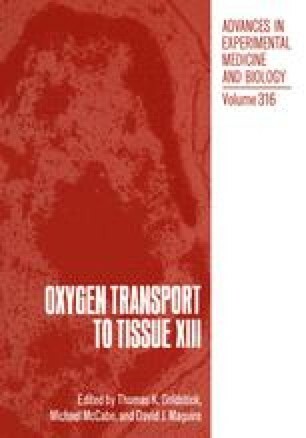 Partial oxygen pressure (PaO2) and oxygen saturation (SaO2) of arterial blood are important parameters for evaluation of oxygen delivery from the alveoli to the pulmonary circulation and are used to assess whether the patients’ lungs are properly ventilated. Currently, it is routine to take a blood sample from patients whenever hypoxemia is suspected or some adjustment to the ventilator settings is required. The problem with the conventional blood sampling method is that sudden changes of blood gas values cannot be observed (Lam, 1987). Though there have been some developments in continuous monitoring of patients’ oxygenation status (e.g. pulse oximetry and transcutaneous PO2 electrodes; for review see: Parker, 1987), it is not possible to continuously or quasi-continuously measure PaO2, PaCO2, SaO2 and Hb concentration at the same time. Recently a method for on-line measurements was introduced for monitoring SaO2 together with Hb and Ht (Schelter et al, 1990; Eijking et al, 1990). High correlations were found between the new method and standard methods (OSM 2 Hemoximeter, Radiometer, Denmark and a Ht centrifuge).